Crystal White launched her career in 1993, attending the prestigious Rhode Island School of Design. She received the CFDA Award in 1997 while only a senior in college for promising/upcoming new talent. White was recruited out of college her senior year to work for popular brand Abercrombie & Fitch before graduation, quickly rising to senior management within 3 years. She has been in leadership roles in various successful brands in Menswear, Womenswear and Childrenswear including American Eagle Outfitters, Suitsupply, Ralph Lauren Club Monaco, Ali Ro, and Osh Kosh B’Gosh before landing a coveted position as a Design Director for Donna Karan/DKNY, where she is currently. After 20 years in the industry, this year 2018, is the first time that any of the companies I’ve worked for have acknowledged and supported MLK Day. It’s significant to me that Donna Karan/DKNY now owned by GIII, recognized and honored this monumental day. It gave me pause and reflection... I felt acknowledged, appreciated and welcome. Recognizing and celebrating the lives of Blacks in American history is important for all Americans, not just minorities. It’s very easy to take for granted the rights that many people before us died to secure. Blacks in the Design industry are few and far between. I have found myself the only executive sitting at the table the majority of my career, but I feel blessed to be here. So to me it is essential to have an awareness of the past, so that we may truly value and appreciate the blessings we enjoy in the present. I'm an interior designer living & loving in Raleigh, NC. I'm passionate about living a well-designed life and serving others along the way. I believe every space needs a little bit of vintage + a splash of brass. I'm a southern girl to the core, who loves playing dress up, and that feeling you get in your stomach right as an airplane takes off. My blog SingleBubblePop began in the fall of 2007 as a way to catalog my journey from pre-med student to interior design professional. Since then, readers have watched me graduate from design school (7 years later!) and work in residential + commercial interior design. I even made my way onto HGTV. I believe that the spaces we live, work & play in have a great impact on our well-being. I'm thinking about all the historic first for black Women this year! Kamala Harris in California, Keisha Bottoms as Atlanta's mayor and Vi Lyles in Charlotte. Black women are resisting in a major way. I think we will look back on this era as a historic moment in our story. I grew up in North Carolina where there is an annual festival in Wilmington called the Azalea Festival. One year, I was blessed to be able to attend with a local group of the historic Tuskegee Airmen. 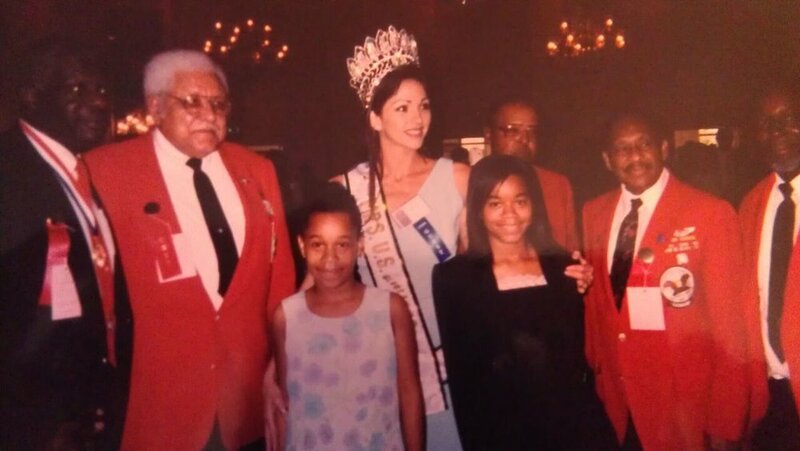 I believe I was 14 years old in this photo that my dad took of my sister and me with the Miss North Carolina of that year. As a young girl, you would think that we would be idolizing this beautiful pageant queen, but we were so enamored with this senior men! The stories that they told us about being fighter pilots, and then their subsequent careers as doctors, dentists and entrepreneurs were so fascinating. They truly made me believe that I could make black history just like they did. Nina Simone. What can I say? As a little black girl pianist also from North Carolina, Nina represented everything I aspire to be. Limitlessly talented on the piano and an amazing singer/songwriter. Courageous, fearless and style icon. She's everything to me! I'm finding a lot of inspiration from visual artists. Some of my favorites right now are Malene B, Rachel Stewart, Victor Ekpuk & Allison F. The way they blend colors and create patterns inspires me so much! Anthony Lavell -the man known as Lyriq- is the owner and part design genius behind the luxury lifestyle brand, VERSTEAL ANTHONY. He is maker of luxury, sayer of phrases, writer of lyrics, and grabber of life. Anthony was born just outside of Washington, D.C. in the city of Alexandria, VA on January 28, 1986. A product of public housing, his parents taught him early what it meant to work hard, be creative, set goals, and meet them. He knew that by getting an education and working hard, he’d be able to accomplish any goal. He had a passion for writing that was encouraged by his grandmother, hence the nickname Lyriq. While attending Virginia State University, Anthony had his first opportunity to showcase his lyrics in a public environment. That moment fed his desire and allowed a creative spirit to flow. That same creative spirit led him on a path of design. It started as a small capsule collection of jewelry which he named AMBITION. With the success of that company, Anthony became inspired to grow, and with that growth came change. He realized that he had to rebrand which allowed him to honor two important people in his life, his grandfather Versteal and father Anthony; thus creating VERSTEAL ANTHONY. BHM is a time to acknowledge the harsh truth of racial inequality, social, economic, and political injustices...all the while celebrating the accomplishments of our ancestors. For me, this is a time to be reminded of their sacrifice and use it as fuel for continuous growth of the community. This photo reminds me that ANYTHING is possible! I find myself getting inspired in so many different situations. I could be listening to a song that I hadn’t heard in ages where I’m reminded of a certain style. Having a conversation with a friend or even a stranger regarding color, trends or brands. When it comes to the topic, I could really go on and on, but I think most of all I am inspired by quality and creating a final product that my clients will love! Above are a few of my inspirations!